Ivy and her mother live in Australia, far away from where the Great War is raging. They have moved in with Aunt Hilda whose flat is so small that Ivy has to sleep under the kitchen table. Not only that, but she also has to empty Aunt Hilda’s chamber pot! ‘The Pests’ live in the flat on one side and, on the other side, lives grumpy old Mr Wilson—who has a deep secret. Ivy writes to her father, who is fighting overseas. She tells him all about life at home—how the family has little money; how she and other children have to sew sandbags, knit socks and roll up bandages for the war; how she volunteers for the Cheer Up Society, making cups of tea at the wharf when the hospital ships come in; and how the Big Pest collects leeches for the hospital. Socks, Sandbags and Leeches is set against the backdrop of the First World War—the Gallipoli landings and withdrawal, the propaganda in Australia and the false reports in the newspapers, schoolchildren’s war work and fundraising, the return of wounded and shell-shocked soldiers, and eventually the wonderful news of peace. 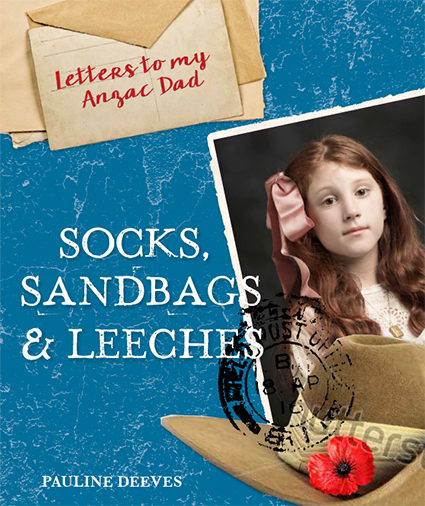 My Anzac Dad is different from most children’s books set in the First World War as, rather than telling the story of war experiences from a soldier’s point of view, it describes life for the people on the home front and the attitudes towards the involvement of Australia in the war. In the 20 letters, written between 1914 and 1918, Ivy covers a range of topics, such as increasing prices and rents, war work, the Cheer Up Society, cramped living conditions, entertainment and sport during wartime, the battle of Broken Hill, attacks on German shops and churches, people’s paranoia, school during wartime, houses of the poor compared to the rich, sock knitting, being patriotic, wounded soldiers, conscription, and coo-ee marches. It is easy to relate to Ivy whose chatty letters make the book very accessible to readers. It is an appealing way to describe to children what life was like 100 years ago, in wartime. In addition, each letter is accompanied by a highly illustrated spread, giving further information about the topics that Ivy mentions.